Boy, ya know it's hot and miserable out when you see dubious photographic news posted, such as this entry. I was playing around inside my nice air-conditioned office/studio/spare bedroom/exercise room/lounge with my new product shot contraption I made and decided to throw a penny down and take a good macro. Incidentally, I almost made the Lincoln penny my regular macro test shot a couple of years ago, thankfully I didn't, as the stamp I ended up using is much more detailed. I never knew of the initials on Lincoln's right shoulder until I took a close shot with my Olympus C-750UZ camera from 2003. Most people have never seen these small initials, even though they carry pennies in their pocket everyday. The upper shot shows the initials location, the lower shot shows them up close. The image was taken with the Sony A700 and Sony 100mm macro lens, 1:1 mag at F/8, 100% crop. I used soft lighting for these shots, but I also experimented with a hand held flash, holding it all around the circumference for strong side-lighting to try and bring out more depth and detail, but the soft lighting ended up looking the best in my opinion. 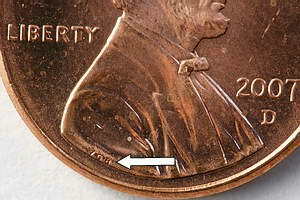 The penny is 3/4" (19mm) in diameter, and the entire image below spans about .06" (1.5mm). Each letter is about .012" (.3mm) wide. Get out a magnifying glass and look at your own penny. 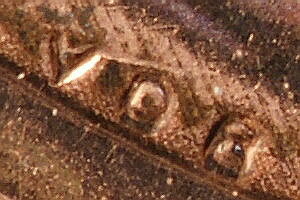 The initials, "VDB" stand for Victor David Brenner, who designed the Lincoln penny for 1909, which looks the same as today's coin. In other news, the Minolta 24mm F/2.8 is quickly rising in price, now expect to pay $210-$280. Also, for some crazy reasons beyond me, I've seen some Minolta 80-200mm F/2.8 lenses going for just a few hundred dollars less than the full retail price of the more useful Sony 70-200mm F/2.8, which will accept Sony or Minolta tele-converters, the 80-200mm will not. Spend the extra money for more usability. KM 17-35mm F/2.8-4 coming soon. I've nearly completed the Sony 70-300mm G SSM F/4.5-5.6 review, I say nearly because I'd like to show some real world telephoto shots and comparisons to other lenses, but this time of year in Tucson, AZ the temps stay around 105° plus, and you wind up with massive heat shimmer, which wreaks havoc on telephoto shots. So the long distance outside shots will come later. I do have a pretty good review though, and have some nice examples of the differences in this lens and the much less expensive Sony 75-300mm F/4.5-5.6. The newly designed Sony lens turned in a great performance, especially wide-open where it's nice and sharp, and has low distortion, ghosting and CA. When reading the review make sure you make the distinction of the two lenses. The $229 lens starts off at 75mm, and the current review lens starts off at 70mm. I also use the "G SSM" to further try and separate them. I've had to push back the teleconverter reviews for the reasons stated above, but I should have the Konica Minolta AF 17-35mm F/2.8-4 wide angle lens review done the first week of July. I found out a few things about Sony DSLR pricing issues (see 6/14/08 entry below) after a talk with a Sony representative. It seems Sony has launched a "unilateral pricing" program. Allow me to translate that into common English for the naive or uninitiated; Sony wants iron-fisted control over dealer pricing. 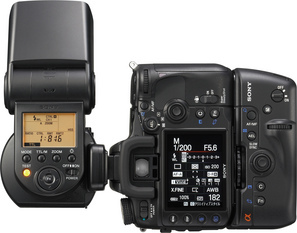 Another translation; DSLR camera bodies and accessories such as flashes and lenses will be priced the same everywhere. This means you'll pay the same at SonyStyle.com or a Sony retail outlet as you would from a discount Internet dealer like B&H photo or Adorama etc. This is probably not a good idea in my uneducated 6th grade drop-out opinion. It sounds sketchy to me. Apparently it only affects new DSLR items, but read below. I'm not sure if this is for the US only or is world-wide. Obviously Sony is taking a risk here in hopes of padding their profits. Some of their lenses are already over-priced. 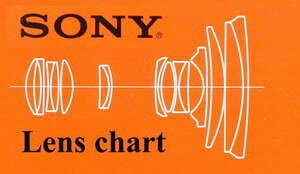 New for the Nav bar is the "Sony lens chart" page. I've listed every Sony lens made, and the two tele-converters, complete with links to that review (if available) all to makes things more convenient for you. This is a good place to visit if you want to check the specs for a lens, or to find out what comes with the lens and any other pertinent information. This is also a good place to get more accurate specs than the Sony website, which is often wrong. I may add more information, or maybe another column or two in the future. Currently, I think I've got enough things listed for a quick check, which is what the page is meant for. On the link, you'll find a table 1200 pixels wide with 17 columns chock full of useful data. If you have a wide-screen monitor, the entire page should fit in view if it's set to max resolution. Up next is the Sony 70-300mm F/4.5-5.6 review. click for lens chart page. I added more items to the lens price guide page. This time accessories, including Minolta/Sony flash units, the ring light, and corded remotes, which are way over-priced by Sony. Get 'em for a fraction of the retail price by buying online, used or after-market. Sony sells the long corded remote for $69.99, but you can usually get used Minolta for less than half that. The short cords are plentiful and sell for a little less than the long, but after-market short cords are under $8. You may wonder why you need one, especially with the A700, which includes a wireless remote, but keep in mind the wireless remote does not act the same as pressing the shutter button. If you use the wireless remote in the 2 second timer mode, it will not lock the mirror up as it does with a press, it'll simply wait 2 seconds and fire normally. If you want to abate camera movement for super telephoto/long exposure shots, use the 2 second timer with the corded remote. Don't forget bulb shooting too! In the A700 manual, they tell you while in the Bulb mode to press and hold the shutter button for the duration of the shot, not a very smart thing to do. To make matters worse, and more confusing, Sony says as an after-thought, "to reduce camera shake, use the remote commander," which could mean wireless or corded, and is used interchangeably by Sony. Basically, don't use the wireless remote for tripod shooting unless you have sufficiently high shutter speeds. In other entertaining news, I've been noticing a change in Sony DSLRs, lenses and accessories pricing for web retailers. For some reason, most items are now selling for full MSRP, just as the SonyStyle.com site does. For instance, I bought an HVL-56AM flash unit about a year ago, paying $309 from B&H photo, which was the going web rate then. Now they sell for $449! The HVL-36AM has actually been lowered to $199, from $299, possibly to keep some distance from the more expensive new HVL-42AM, priced now at $299. Also, most Sony lenses were discounted about $20-$50 off full retail from B&H, Adorama etc, not so anymore. Maybe Sony is looking to line their pockets a little more. In Sony's defence, I think the A200 for $499 is the best bargain out there for current entry level cameras, easily beating the Nikon D40 which doesn't have IS. Sony often reduces retail prices very quietly, so you may wind up with a better bargain by going directly to SonyStlye.com. Did you know Sony has a new gold colored body on the A300 as an option? If you like "bling" this is for you! Hopefully, this is a short-run trial and won't catch on. 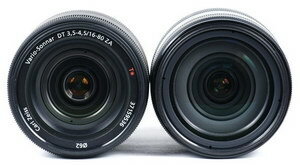 I whipped up a brief comparison page between the Sony Carl Zeiss 16-80mm F/3.5-4.5 and Sony 16-105mm F/3.5-5.6 lenses. If you read the 16-105mm F/3.5-5.6 review, you probably don't need to check it out, it's mostly the same except I've added some different product shots and macro crops taken at the full 12.2mp and cropped, then cropped again for you dial-up users. Anyone noticed something strange going on with Sony DSLR gear pricing? Of special concern are the big web dealers. More later. The newest addition to the site is the Sony/Minolta AF lens price guide. This page has been in the works for quite some time, and it's ready for immediate use. Notice I've put a link on the Nav bar for handy one-click access. You'll be able to get an idea of about how much you're going to need to pay for new and used Sony, Konica Minolta and Minolta AF lenses. I've included all 26 new Sony lenses and teleconverters, and will include legitimate internet dealers prices in the guide as well, though most will be based on eBay final selling prices. Please note I haven't included all Minolta lenses and probably won't. I'm just going to stick to the more popular ones right now due to time constraints. As I state on the page, I plan to update the "selling price" box whenever there's a change for that particular lens, or about once a month. There're over 70 listings right now, and some information is missing for certain lenses, more time will be needed to fill in all the boxes with accurate estimates, so be patient. I'm also going to add some other items of interest in the future, like Sony DSLR accessories such as flashes, remote shutters and cases etc. Next up, I have a comparison page that should be ready by mid-week that'll illustrate the differences between the Sony Carl Zeiss 16-80mm, and Sony 16-105mm lenses. It'll be mostly a re-hash of the 16-105mm, so if you have read that review and the Carl Zeiss review, you don't really need to look at it. It's meant to be a handy page for people considering both lenses. 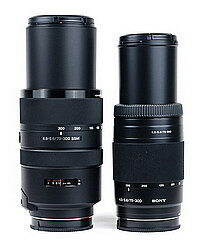 I'm working on the new Sony 70-300mm F/4.5-5.6 G SSM lens review and should have it ready by the middle of the month. So far, it's a gem. 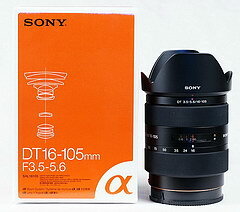 Up next for your consideration is the splendid Sony DT 16-105mm F/3.5-5.6 telephoto lens. I've tried to compare this lens with the Carl Zeiss 16-80mm F/3.5-4.5, and as usual, I got carried away. I'm going to do a new comparison review of the two on a separate page. This review is complete though, you'll be able to make an informed purchasing decision if you read it through to the end. I also have a Konica Minolta 17-35mm F/2.8-4 that I'll review sometime this month hopefully. You see these on eBay quite often for around $300 used, or sometimes new, normally they retail for around $369. I'm now hard at work on the lens price guide, and I'll add a link to it on the nav bar under the "Lens Reviews" link.